ShadowTool simplifies your eBay searches and makes buying safer and easier! Get a Security Analysis to protect yourself from a suspicious seller. Save the auction to the My Auctions page for watching or bidding. 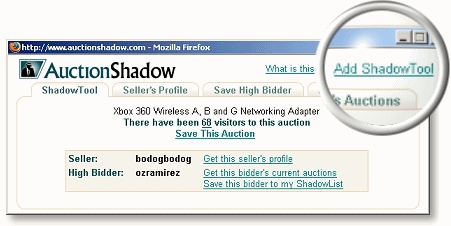 Use ShadowTool as you review your AuctionShadow search results, or as you browse eBay. OK, so how do I set it up? ShadowTool is automatically displayed as you click on your AuctionShadow search results. You may also add ShadowTool to your browser's toolbar from that popup by clicking the 'Add ShadowTool' link. If you have a popup-blocking utility on your computer, be sure you allow "auctionshadow.com" to open pop-ups. Once ShadowTool is on your toolbar, click it any time you are browsing eBay.